I'm so happy that you stopped by on your weekend, to have a look see at what I have been creating. 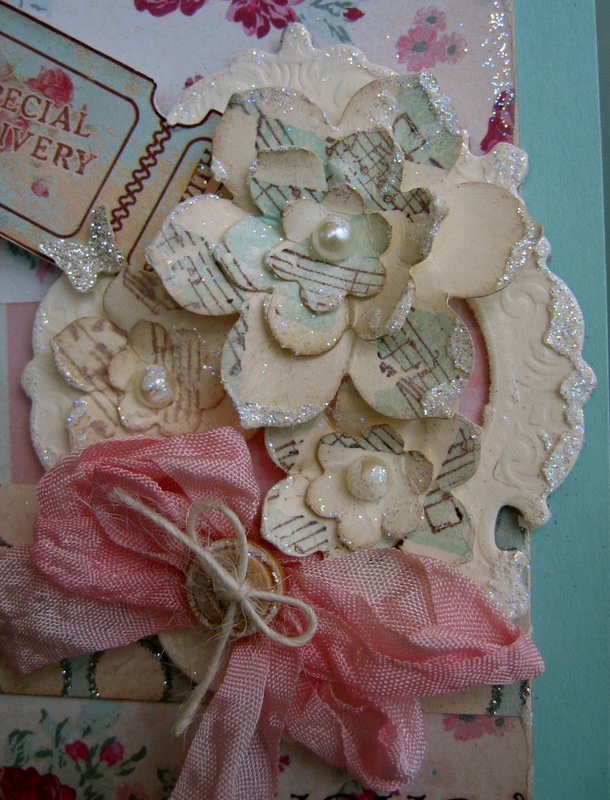 On this Saturday, the lovely Lisa Minckler, has given us a creative challenge over @ Our Creative Corner. Lisa, has requested that you create a paper craft item using the 'Kissing' technique. And she would also like you to include the letters: X, and O. How fun does that sound? Here is my take on Lisa's challenge. I am a big fan of shabby chic. And since I didn't have any product restrictions, I decided to use about everything in my craft room. Please take a moment to get a good look. There is a lot going on with this card! For the card base, I used Aqua mist card stock for PTI. The pattern papers are: Glitz (pretty in pink), Lost & Found (blush, and buddies). 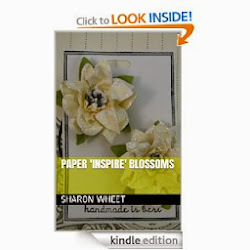 To create the flowers, I used the kissing technique to create pattern paper, and then the birds & blooms die. I inked the harlequin pattern (Print Pattern) stamp from Stampin' Up! and then kissed it with the music stamp (Composer's Dream) by Stampabilities. I inked the edges and crumpled the blossoms. After I stacked them, I edged the petals with picket fence crackle paint, and then dunked into a tub of dazzling diamond glitter. The frame is from Tattered Angels. I believe it was discontinued 3yrs ago. I edged the frame in picket fence crackle paint and then dipped into dazzling diamond glitter. I used white seam binding (trimmings, from Tim Holtz) and used my spun sugar distress stain. I tied a wooden button and tied it on with some cream twine. 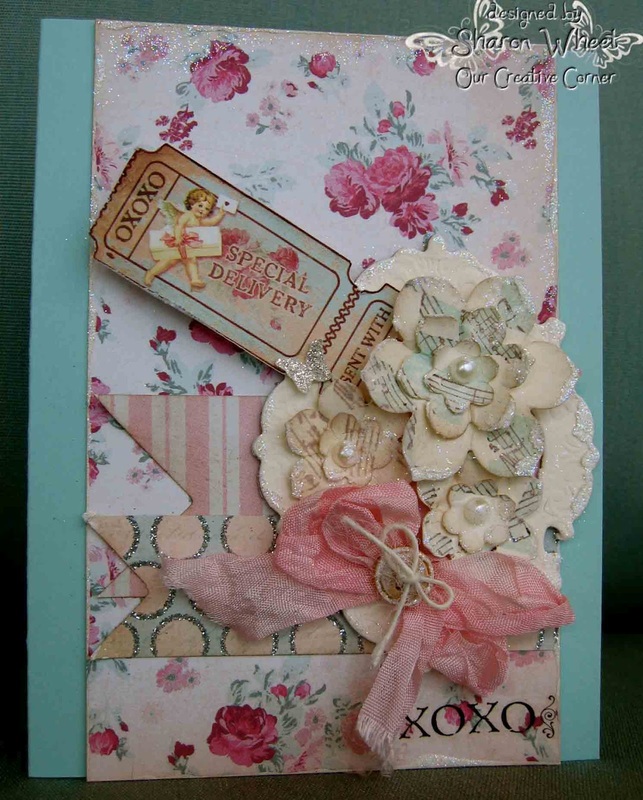 To get my XO requirement, I added a 'ticket' from 'Love Mail' by Crafty Secrets. I also added a rub-on from Karen Russell's Narratives Swatch Book. I also added a tiny silver glitter butterfly to the 'ticket' to give the card a 'surprise'! I hope that you get a chance to play along with us @ Our Creative Corner. 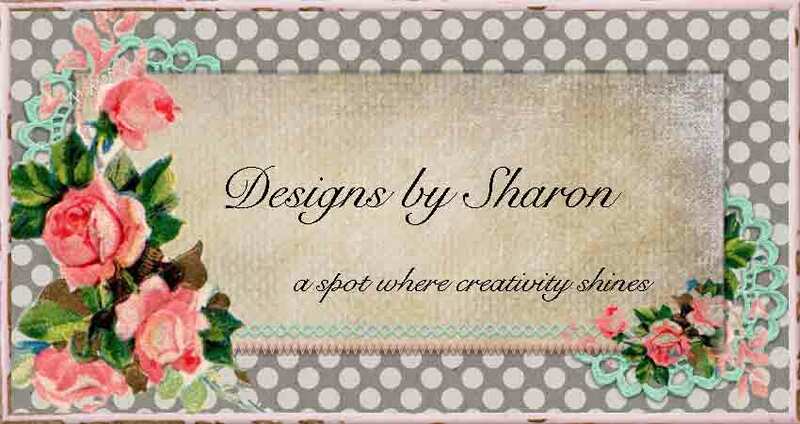 This is such a gorgeous card, Sharon. I love the beautiful flowers with glitters and pretty background dp. Totally stunning! I am a great fan of Shabby-Chic too Sharon, although one would not think it with what I presented this week! Anyway this card is a delight for the eyes, and your Bg has a vintage feel, your flowers and colour palette relate the soft femininity that one likes to see in this genre. OH MY GOSH...Sharon!! Firstly, I had to laugh outloud when I read you dunked items in a "tub" of glitter. Hahaha...it's so great to know that other people use tubs too. :D I usually look like I fell in that tub when I'm done. I about sprang out of my chair when I saw your card posted on the DT blog. This is just sensational! Your textures and colors and eye for even the most minute details is superb and it sings a glorious song of shabby chic. I love the eclectic placement of paper patterns and the tag..WOW!!! Excellent job on this kissing technique and your X's and O's gave me the biggest smile. :D See? Truly beautiful card and I love everything about it!